It's no secret to prototype modelers that the historical society for their chosen railroad can be a priceless resource of information. For the New York New Haven & Hartford Railroad, that society is the NHRHTA. Many of the photos you see here come from the collections of NHRHTA members and from the Association itself. Additional information can usually be found in its flagship publication, The Shoreliner and you can even download their modeling magazine, The Speedwitch. If all else fails, you can often get quick responses to your questions by posting to their discussion forum. So it's no surprise that I got onto the Forum to see what I could learn about NHRR structure colors - and hopefully find out what color the Saybrook tower was painted circa 1947. In perusing old posts, I discovered two threads dealing with NHRR structure colors, one from just earlier this year and one from 2013. "In the early 1900's the scheme was tri-color which I believe was chocolate brown trim, tan wainscoating and window sashes and cream siding above the wainscoating. 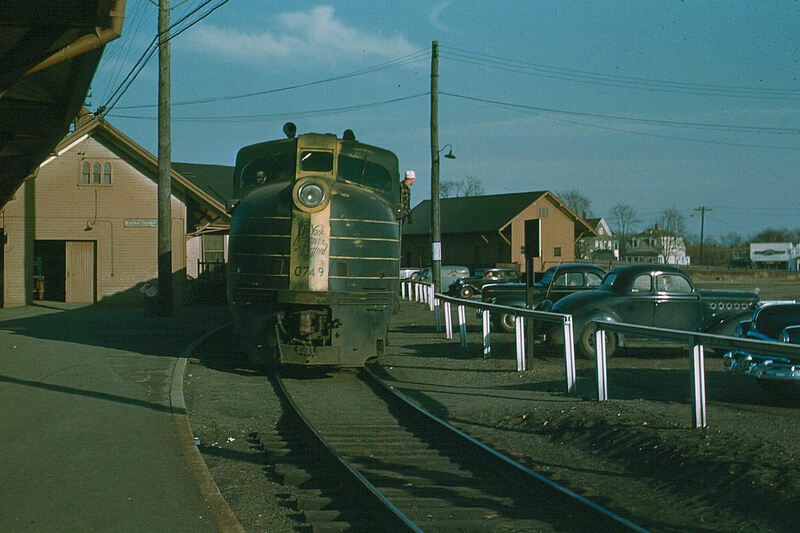 This changed somewhere between the onset of the Depression and the end of WWII to a bi-color scheme of tan trim and wainscoating and cream siding and window sashes like the Danbury freight house and the Cornwall Bridge station. 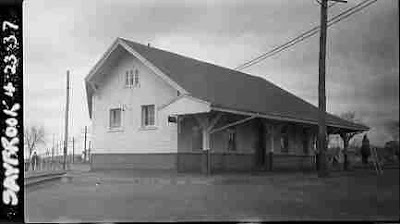 By the late forties this became overall tan with white window sashes and undersides of overhanging roofs for passenger stations (Canaan, CT) and just tan for everything else." So it appears the station at least - and consistent with what Bill said - was repainted from two-tone to plain brown sometime before 1949. Since I model October, 1947 (with an occasional foray into 1949), it'll be interesting to figure whether I stick with boring all-brown, or if I swap out different colors of stations depending on the ops session . . . Anybody have any idea of the time period of this photo? My guess, based on the billboard and the scalloped siding on the 2nd floor, would be sometime in the 1930s. What do you think? (oops! scalloped siding here too - so I guess the kit is wrong) Definitely post 1947 - more like 1957. But at least it looks like we can conclude that in c.1947 the tower was all tan. So, go safe with doing all the Saybrook railroad buildings in the all brown scheme, or use a little modeler's license and speculate that the station and freighthouse at least were still two tone in 1947? As Bill said, "do you want to go with era specific paint which may be double plus un-fancy or do you want to go with a flashier paint job which may be a bit anachronistic?" Unless I can get some more information, it looks like I may have a tough decision to make. But it won't be the first time a prototype modeler had to choose between 100% accuracy and something more aesthetically pleasing. Looks like tower was a solid color, guessing brown in the undated black and white that can't be older than the twenties when the advertised Hotel Chesterfield was built. Color McGinnis era photo still all brown/tan. doubt any repainting occurred during WWII, solid brown/tan in John Wallace photo of 49 or 50. If you model into 49 I would think station all brown/tan. Without a dated photo from 47, I think could be period correct ether way. A more troubling question has come to light by comparing the two tower photos though, what about the HORN?? What was that used for? Black and white shows a horn under the spot light on the second floor, light is still there but horn is gone in the McGinnis era photo. When was this neat detail removed, better find out about that! And wow - I hadn't even noticed the horn! Thanks for pointing it out - anybody have any ideas?? And here's the latest from John Wallace (who took the color photo of the DER-1 (DL-109) - his best recollection is that it was taken in early spring 1949. That is a tough call! The black and white tower image does look like the wainscoting is darker than the rest of the siding, but not as much as the two tone station. The station with the DL109s seems to have the white on the bottom of the roof over hang. I can only guess that the brown (tan?) paint was not carried all the way up to the eves, and some remnant of the old cream paint is showing as a gray tone. It appears an "obscure" company called Branchline Laser Art has several styles of fish scale singles.